Happy Birthday Robert Luessen! Welcome to 27, it's going to be your self-proclaimed coolest year yet. Last year he got a vanilla peach layer cake with honey buttercream frosting, this year he got giant diner-style grilled blueberry muffins with homemade bourbon vanilla bean ice cream. If you're from the Jersey or tri-state area I would imagine you're familiar with grilled muffins. I'd never had one until I started dating Robert and he insisted I order one in a South Jersey diner. My mind was blown. Since Robert grew up loving these insanely simple and delicious muffins I decided it would be a fun alternative to a birthday cake, and since it's not a proper birthday without ice cream, homemade bourbon vanilla bean ice cream sweetened the deal. 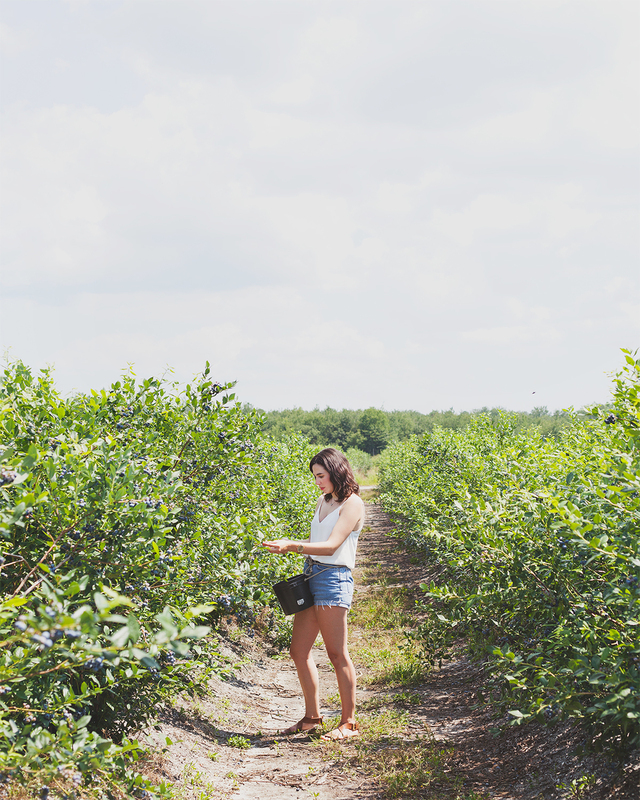 We went berry picking in the heart of Jersey blueberry country. For $12 we left with a giant bag, gave away pints to family and still had more than enough for ourselves. It's the perfect summer date day. Blueberries are super easy to pick, and it goes fast. I felt like we had just started when our buckets were already half full, and they were the best berries I've ever tasted. 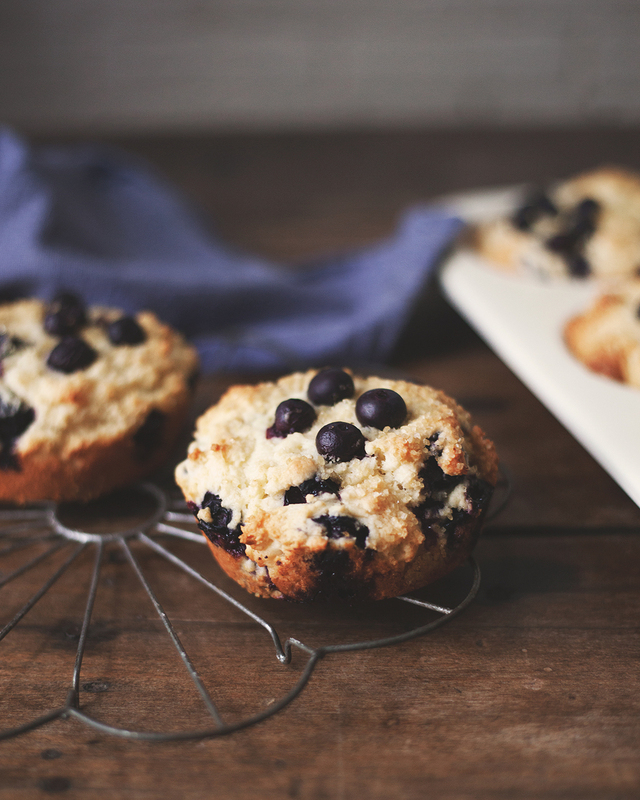 Even without the extra step of grilling, these muffins are perfect on their own. They have a light and fluffy texture, and taste like a little mini cake once grilled and served with ice cream. Since these got topped with ice cream I opted to use my large muffin tin (which is lovingly stained from my previous batches of blueberry muffins). The larger size pan will take the batter from 12 muffins in a standard pan to 6. Preheat oven to 425° and prepare a muffin tin with cooking spray, set aside. Begin by sifting together the flours, baking powder and salt in a large bowl and set aside. Using an electric mixer beat the sugar with butter until completely smooth. Add egg, followed by egg yolk, stirring well after each addition, about 3 minutes. Add greek yogurt and continue stirring until the batter is completely smooth. Add flour mixture and stir to combine. Gently fold in blueberries, taking care not to overmix. Spoon the batter into the prepared muffin tin evenly. Top with the reserved 1/2 cup blueberries, pressing down a bit so they stick and sprinkle with raw sugar. Bake at 425° for 5 minutes. Reduce the heat to 350° and continue baking for 25 minutes more until the edges have browned. Prepare a skillet or griddle over medium heat and melt about 1/2 tablespoon butter. Slice the muffins in half and place on the grill facing down once the butter has melted. Grill until brown, about 2-3 minutes. Serve warm with bourbon vanilla bean ice cream. Using a sharp knife, split vanilla beans and scrape inner flavoring from pods. Set aside. In a small saucepan, simmer cream, milk, sugar and salt until sugar is dissolved, about 5 minutes. Add vanilla, remove from heat and set aside 1/3 of milk and cream mixture. In a large bowl, whisk egg yolks until combined. While whisking, pour milk and cream mixture into yolks. Continue whisking until combined. Pour yolk and cream mixture back into the pot with remaining cream, whisking to combine. Return pot to medium-low heat and continue cooking while stirring constantly until mixture is thick enough to coat the back of a spoon. This will read 170° on an instant thermometer and take about 5 minutes. Strain through a fine-mesh sieve and cool. Add bourbon, cover and chill for at least 4 hours. Churn ice cream according to manufacturer’s instructions. Remove and freeze for an additional 2 hours for hard ice cream. Scoop and serve.